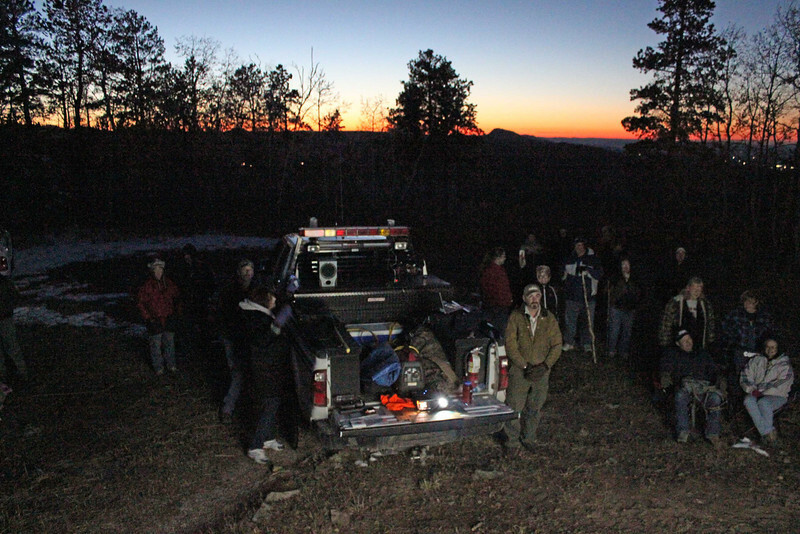 This is a gallery of photographs and brief narratives from the 2012 Moon Walks in the Black Hills National Forest. 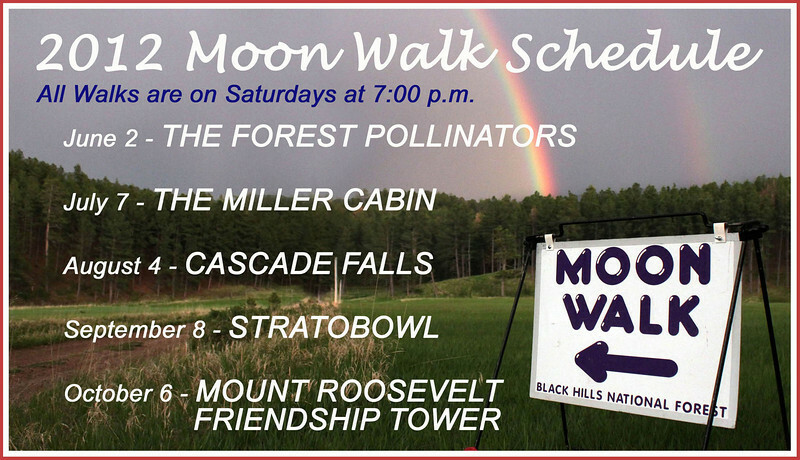 A schedule of the walks is shown below; Moon Walks are held on a Saturday night close to the official full moon, and they normally last about 90 minutes to two hours. Usually, they're only about one mile round trip. 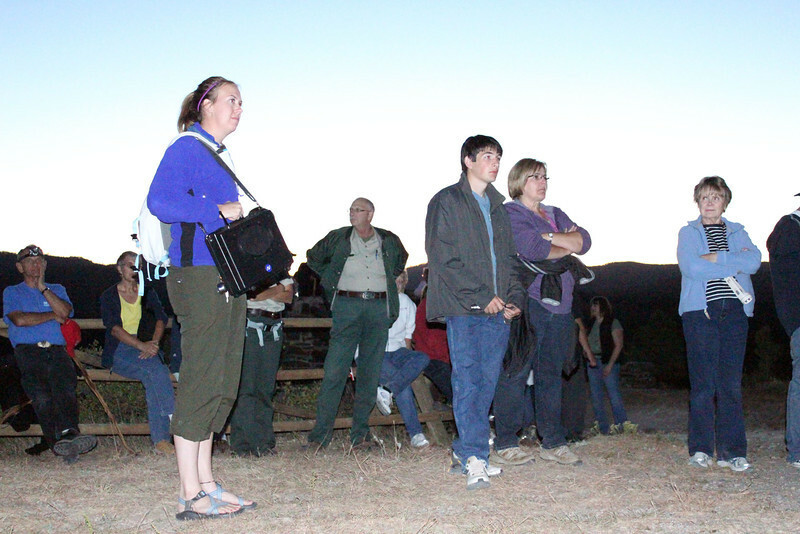 Each session begins with a short introduction to the night's program, then we hike to a designated area in the forest for a short presentation by experts in a variety of fields from botany and history to wildlife and geology. 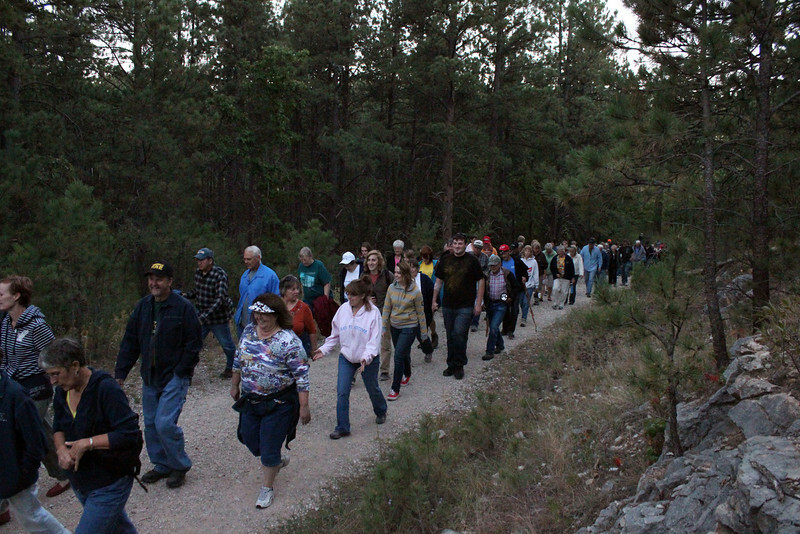 About 100 people participate in each Moon Walk. 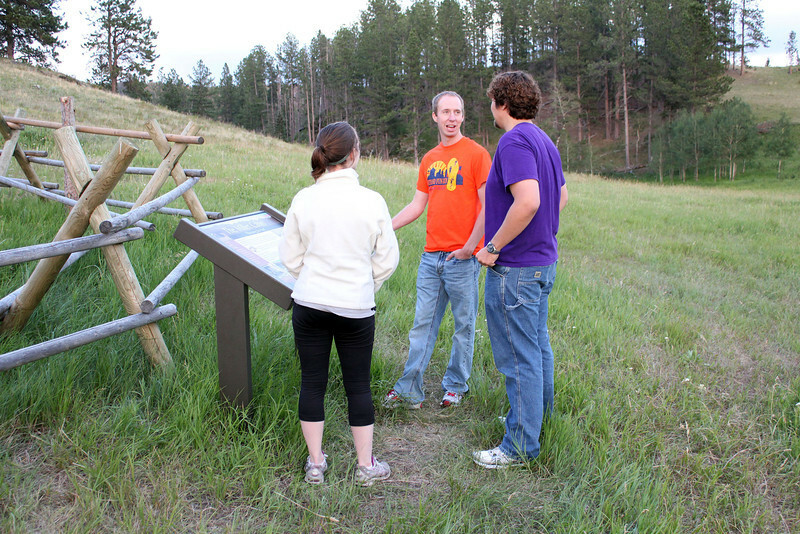 The programs are designed to provide a "family oriented activity" that introduces visitors to the cultural and natural history of the Black Hills. As you stroll through these images, you may click on any photo to choose a larger version. 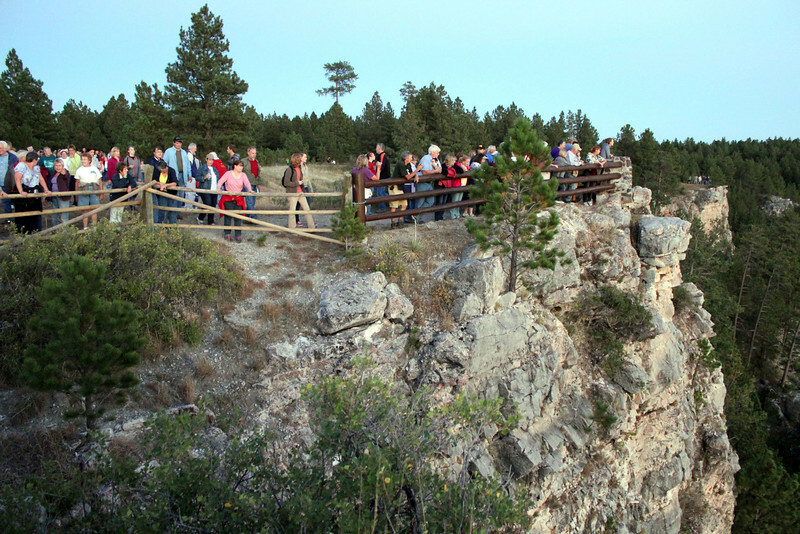 MOUNT ROOSEVELT FRIENDSHIP TOWER 6 October 2012 For the final Black Hills Forest Moon Walk of 2012, about 40 folks made the short hike up Mount Roosevelt north of Deadwood to take an early evening peek at the Friendship Tower erected by the Society of Black Hills Pioneers in 1919. 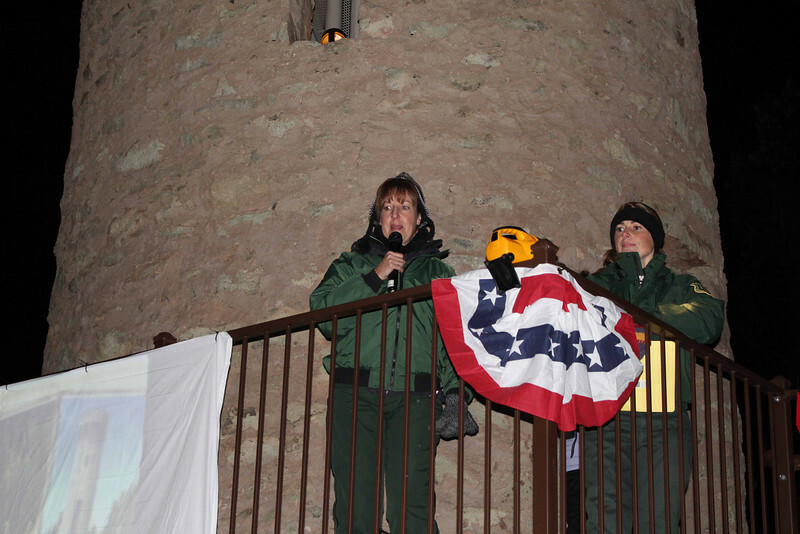 Considerable improvements have been made to the structure by the U.S. Forest Service and volunteers in an effort to preserve the structure and provide greater accessibility. 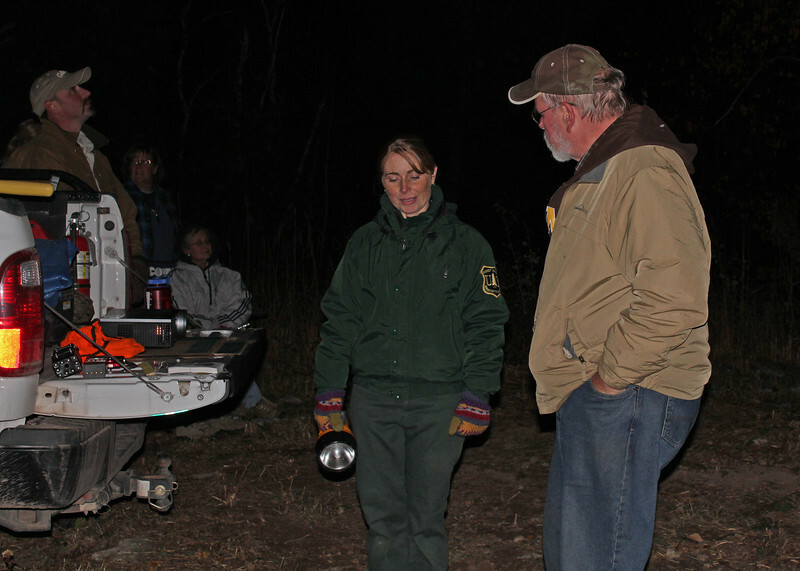 That's Ranger Amy Ballard on the left, and Forest Service archaeologiest ____ on the right. 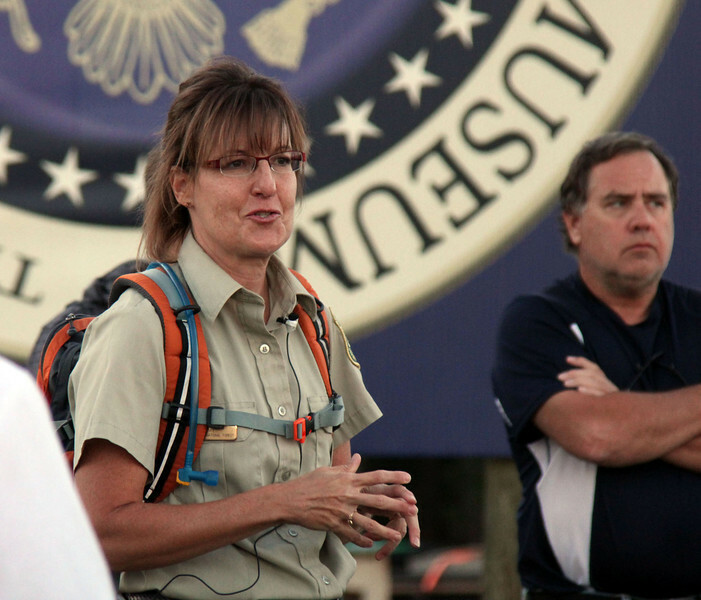 Amy has been involved in planning and implementing the Moon Walks since they began some 17 years ago. 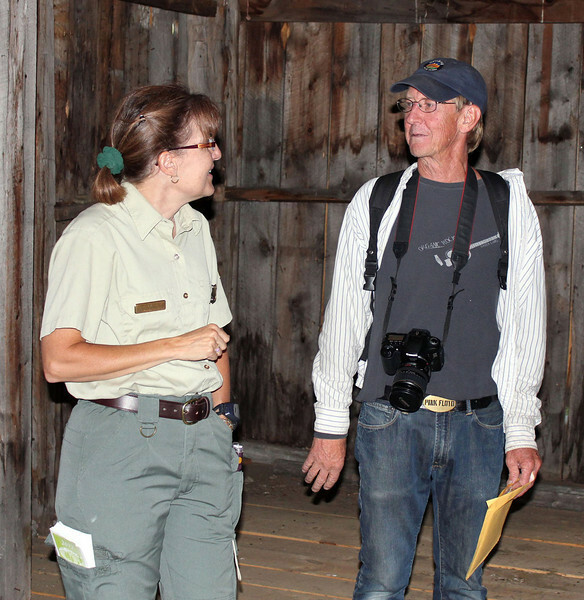 Ranger Marissa Karchut visits with Black Hills State University professor David Wolff before the Moon Walk presentation began. 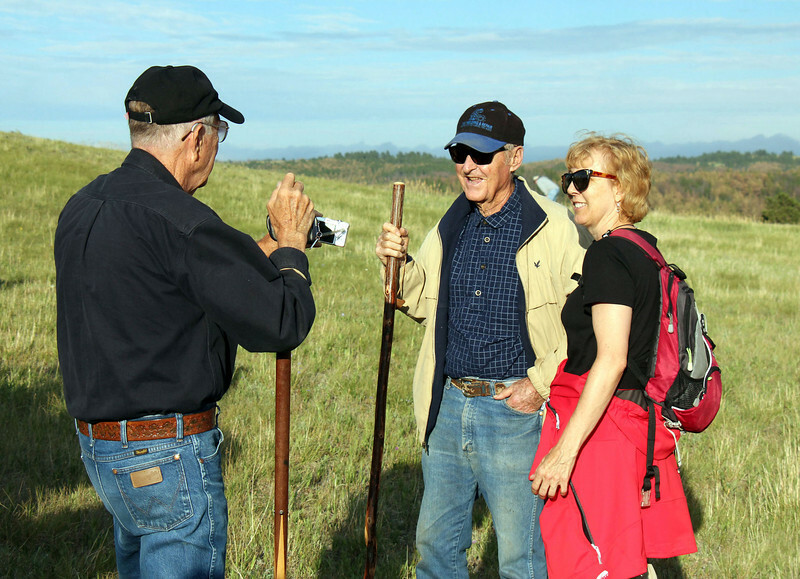 Wolff has keen insight into the career of Seth Bullock, who was a prime force behind persuading the Society of Black Hills Pioneers to build that tower in 1919 as a tribute to his friend President Theodore Roosevelt, who had died earlier that year. 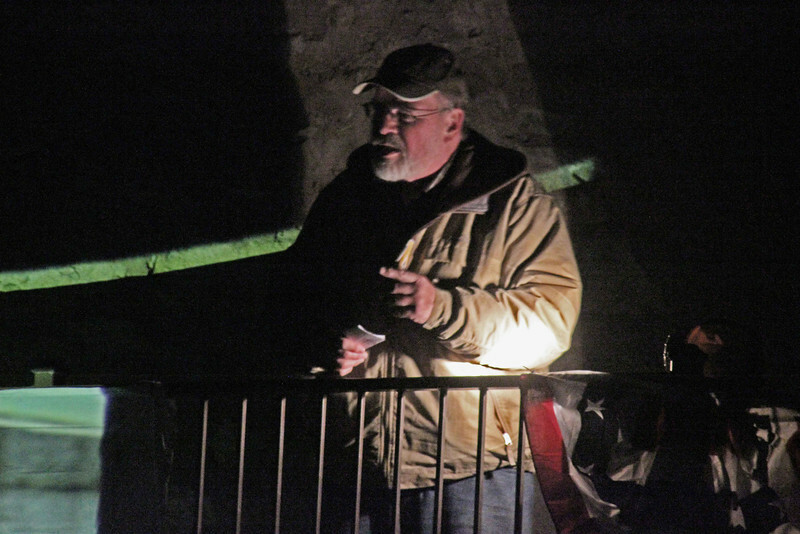 Standing on an elevated landing near the bottom of the 31-foot tower, David Wolff shared a variety of anecdotes about the colorful Seth Bullock. 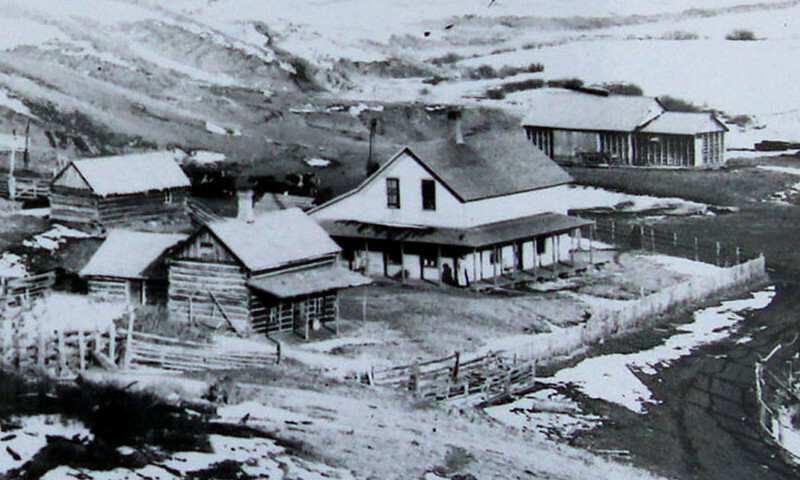 Bullock was a businessman, entrepreneur, lawman, and forester. 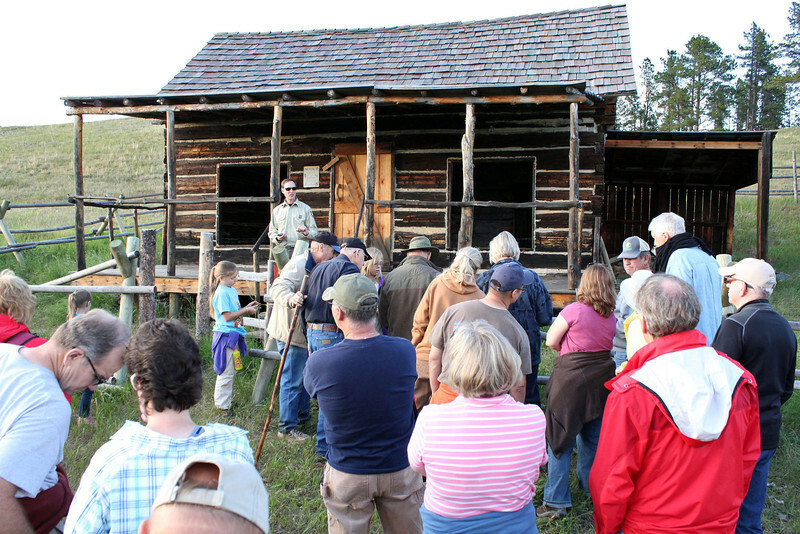 His varied activities are chronicled in Wolff's book Seth Bullock - Black Hills Lawman. 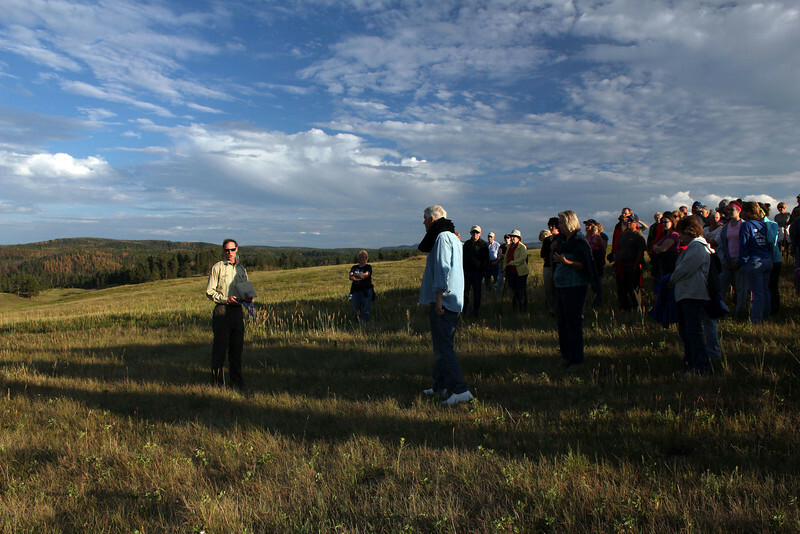 STRATOBOWL 8 September 2012 That's Recreation Forester Amy Ballard gathering hikers for the September 8th Moon Walk to the Stratobowl, located about 12 miles southwest of Rapid City. 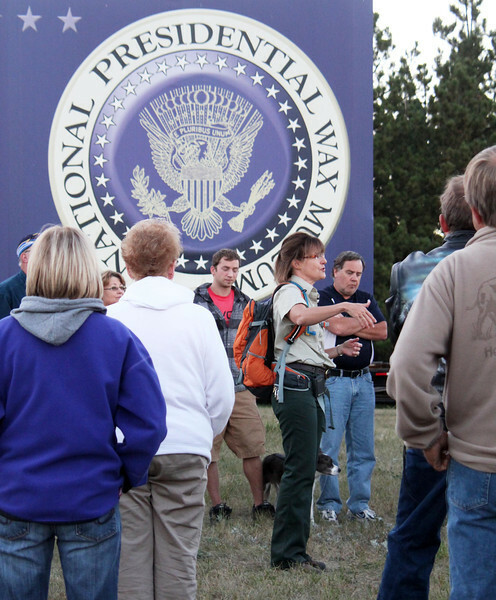 The mustering site was at the Forest Service access road near Mount Rushmore Road. 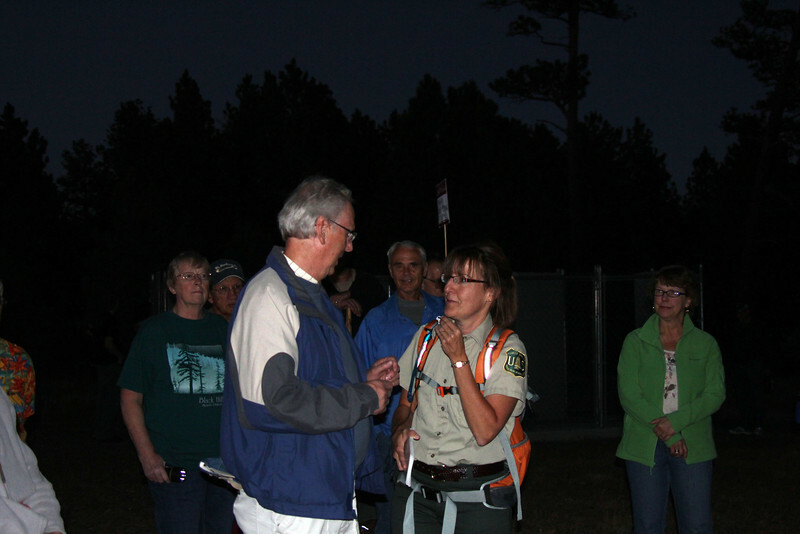 Amy explained the cancellation of the August Moon Walk to Cascade Falls south of Hot Springs. While a handful of previous walks have been cancelled by lightning -- and even snow -- this was the first outing cancelled by extremely dry conditions. 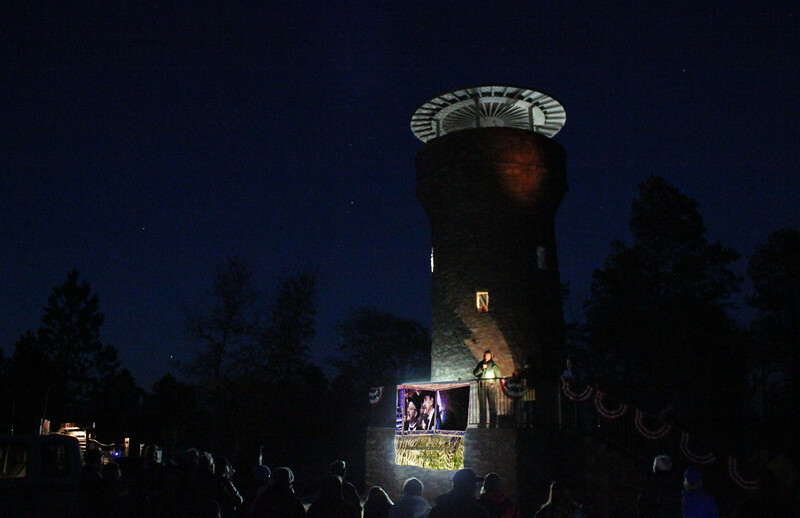 Cascade Falls will be included in the Moon Walks planned for 2013. It was a pleasant walk of about 45 minutes along a path that was graveled most of the way. Keeping a count of attendees turned out to be a bit of a challenge this time.....but the best count was 275! That's probably a record -- or close to it says Ballard, who's been involved with the walks for 17 years. Who needs GPS? We had a lead dog that kept us on the straight and narrow. This was our destination -- a ridge overlooking what used to be called "Moon Valley," before the National Geographic Society and U.S. Army Air Corps launched Explorers I and II from the valley in the mid-1930's. 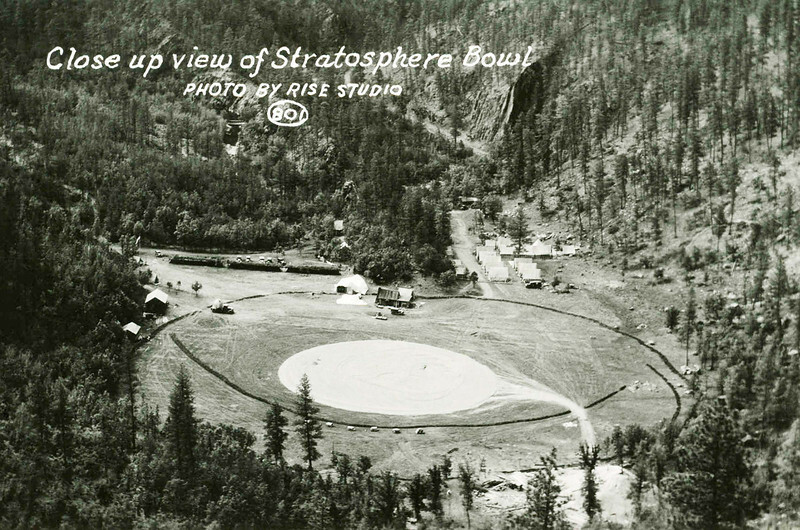 From that point on -- it became known as Stratobowl. 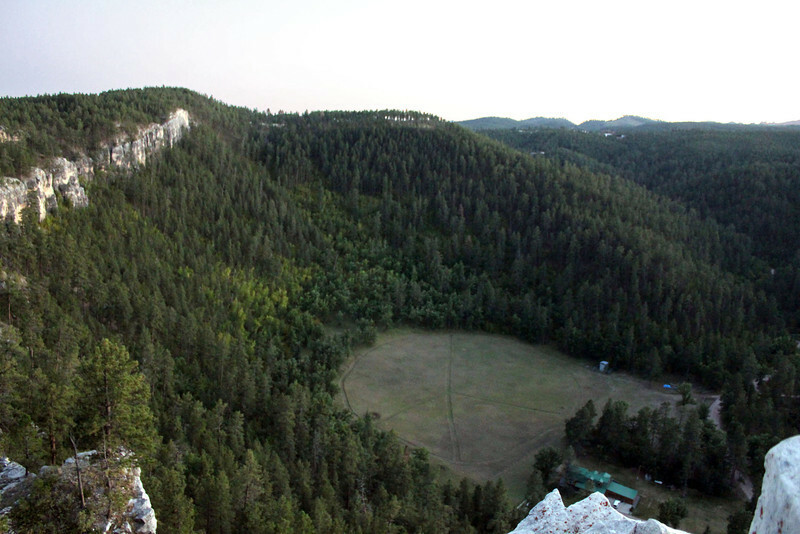 Here's a panoramic view of this special spot in the Black Hills. Click on the image and get a closer look! Much of the land were the Stratobowl is located is privately owned. Notice homes located around the perimeter of the cleared area. 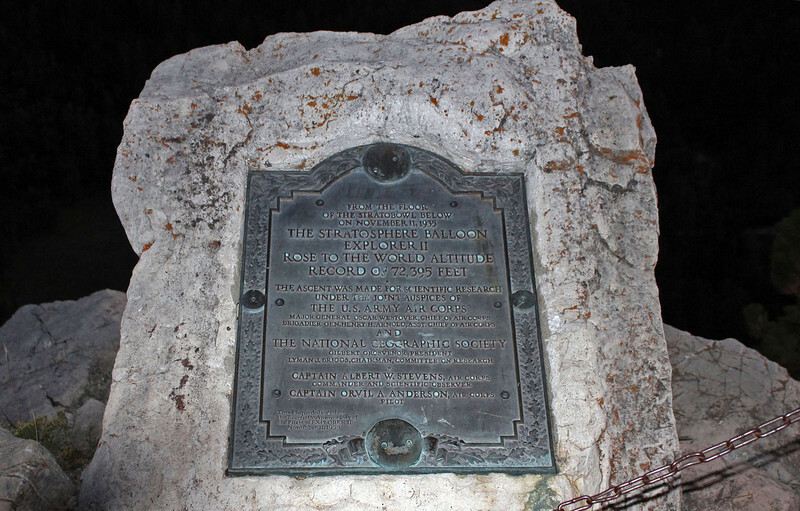 This sign provides visitors with a bit of information telling about the 1935 Explorer II event from this location. Fortunately, we had Arley Fadness with us, and he provided considerable detail about five significant events that were staged at the Stratobowl. 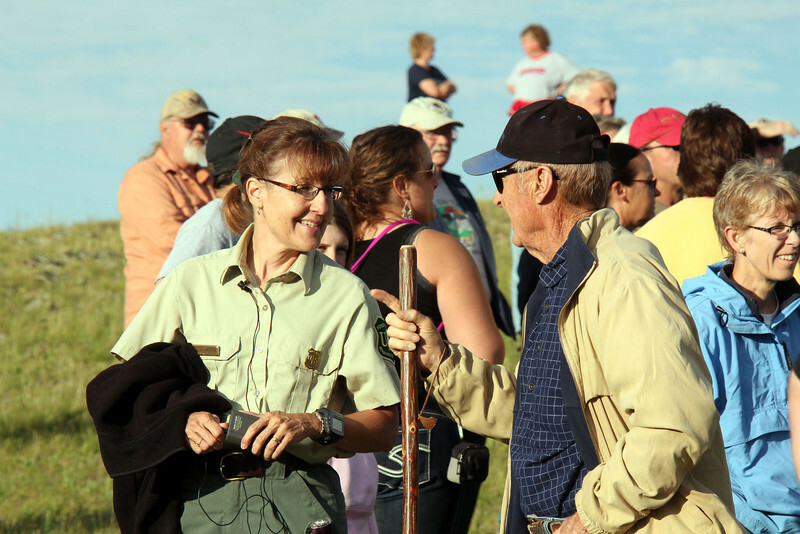 Amy also introduced a gentleman who witnessed the 1934 lift-off of the Explorer I balloon. That man is Bill Garwood, who was just eight years old when the event took place. 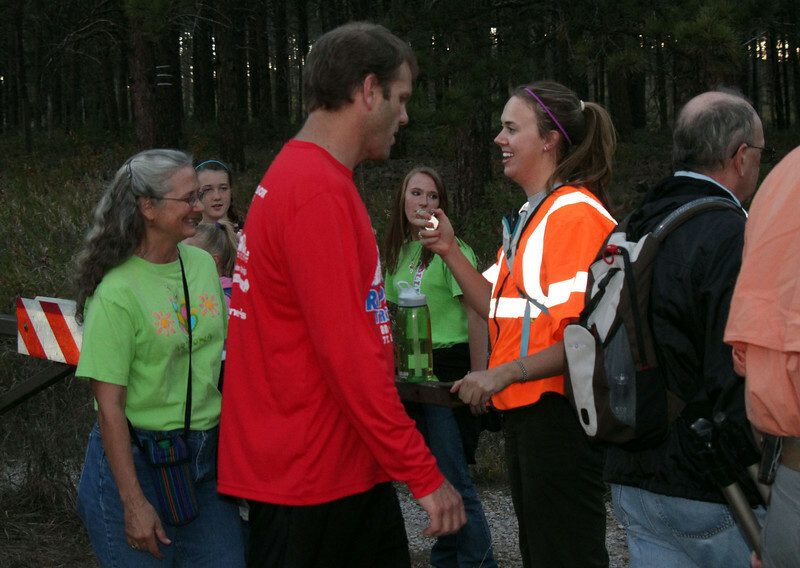 Amy shakes hand with Mr. Garwood. 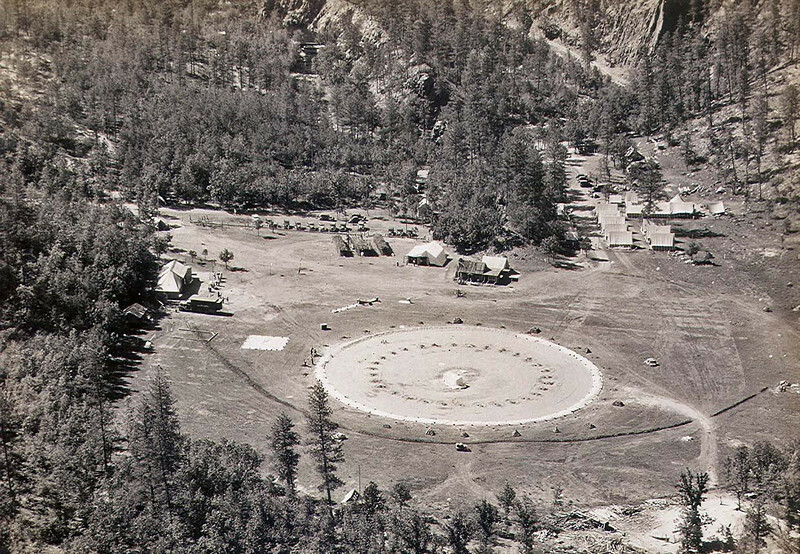 This undated photo was likely taken in the mid-1930's when Explorer I and II took place. Fadness noted that the area became something of a community. Notice the many tents and vehicles in the vicinity. Taken from nearly the same location as the above vintage photo, this one reflects even more activity has taken place in the area. 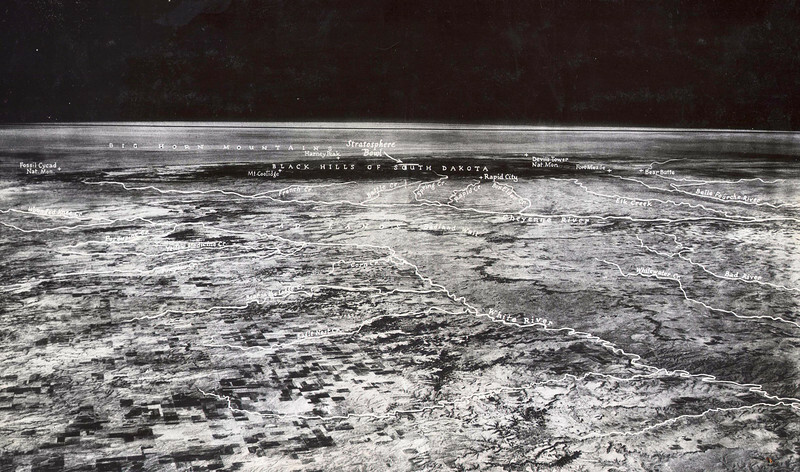 Taken from a high altitude balloon 72,395 above White River, South Dakota in 1935, this remarkable photo was the first to show the curvature of the earth. 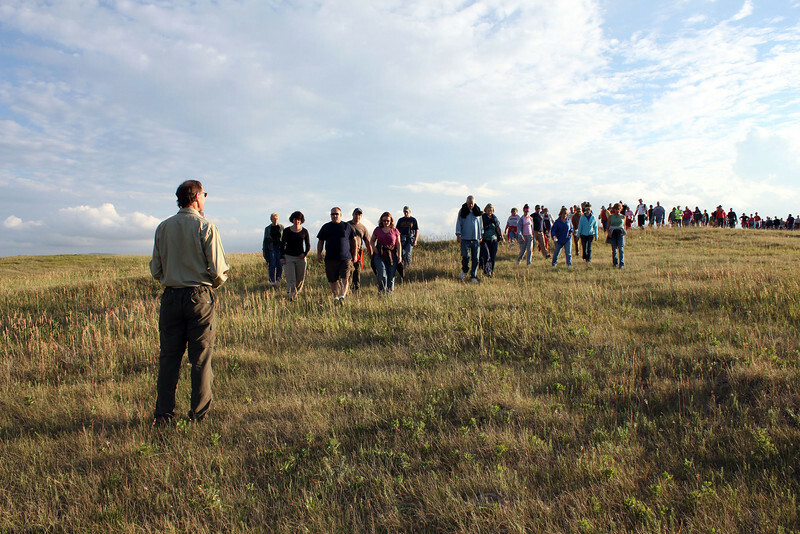 Explorer II was launched from the Stratobowl east of Rapid City in a joint effort by the U. S. Army Air Corps and the National Geographic Society. Take a closer peek at this image by clicking on the photograph and choosing one of the many size options at the top of the page. Enjoy! Thanks to Jerry Bryant of the Lawrence County Historical Society for sharing these great historic photos. This is the cutline that accompanies the above photograph. It provides some of the details surrounding the launch and achievements of Explorer II. 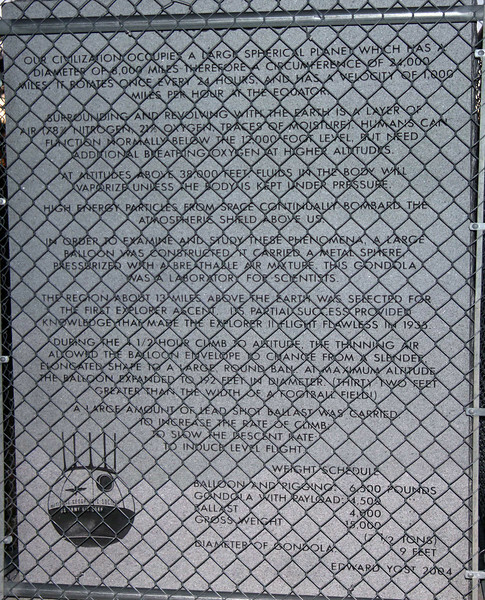 Click the photo to see a larger version. 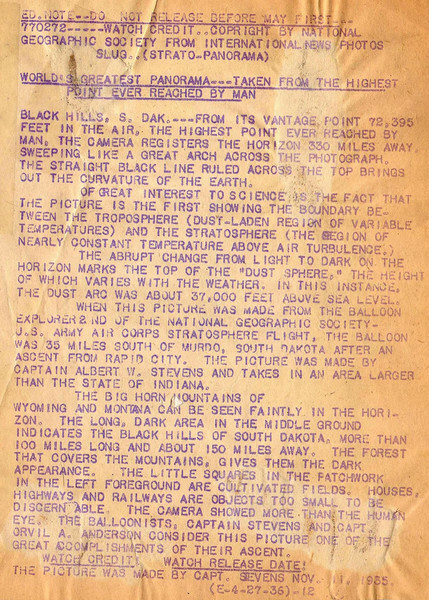 Hot air balloon developer Ed Yost prepared this information, which is inscribed in stone at a site on the rim of the Stratobowl. It had been a beautiful evening for a Moon Walk. We should always be so lucky! A final flash photo on the rim above the Stratobowl. Camera flash off, and it's time to say "Good Night!" 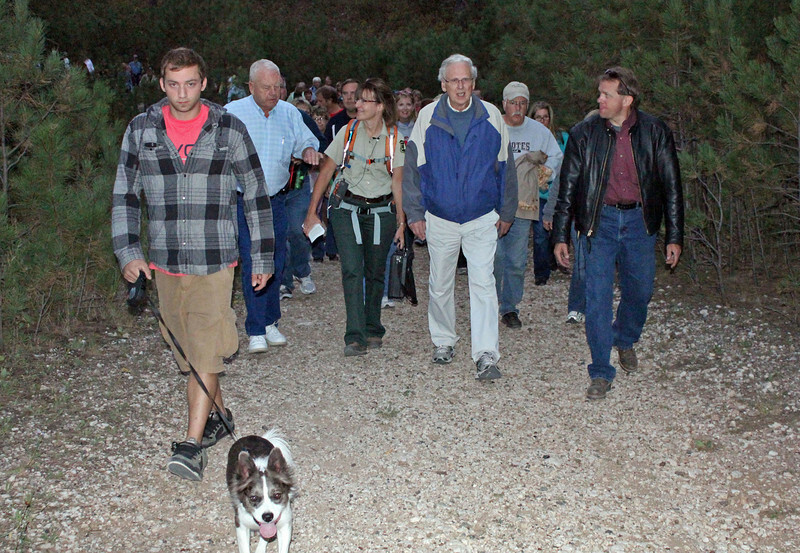 To continue in our Moon Walk Gallery, simply click on the next gallery page below, or... Return to Black Hills Journal. THE MILLER CABIN 7 July 2012 Nearly dead center in this photograph is a small building now popularly called the "Miller Cabin." This undated early photo shows the structure -- along with many others -- on the Miller ranch, nestled on land that is now inundated by the waters of Deerfield Reservoir west of Hill City. Remember, you can click on any of these photographs to select a larger version. 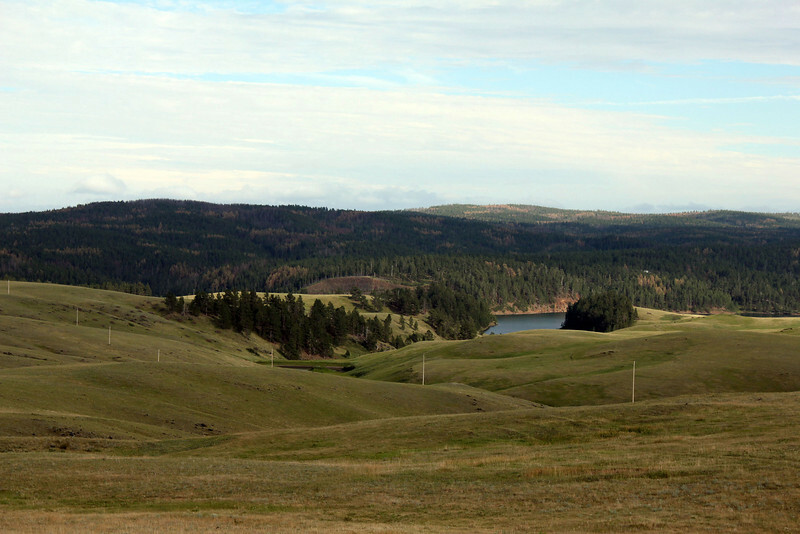 A portion of Deerfield Reservoir as seen from a knoll on Reynolds Prairie. 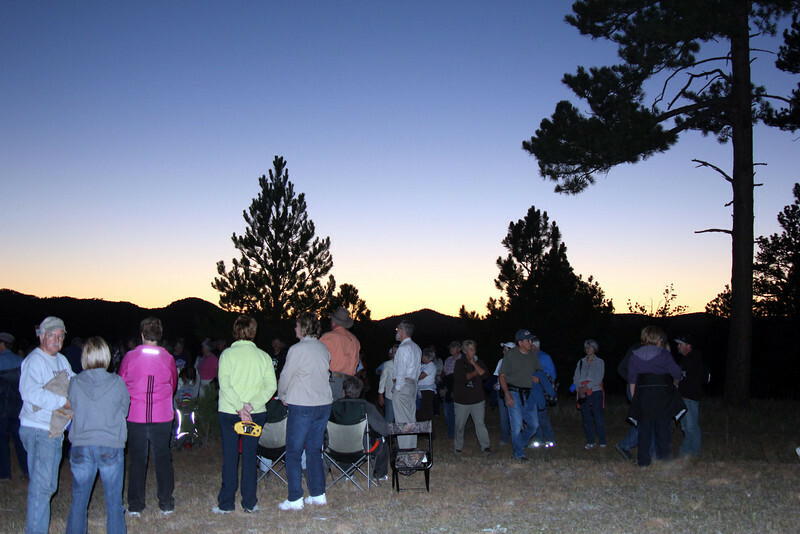 As we arrived for this July Moon Walk, we could see just a glimpse of Deerfield Reservoir. The Miller Cabin is not visible in this photo. 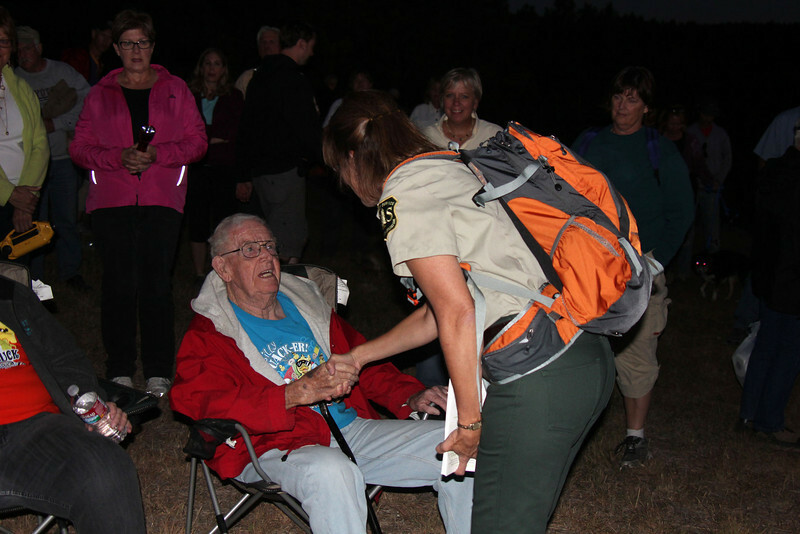 Recreation Forester Amy Ballard (left) visits with one of our hikers as folks aggregated and visited before the 7 o'clock hike began. 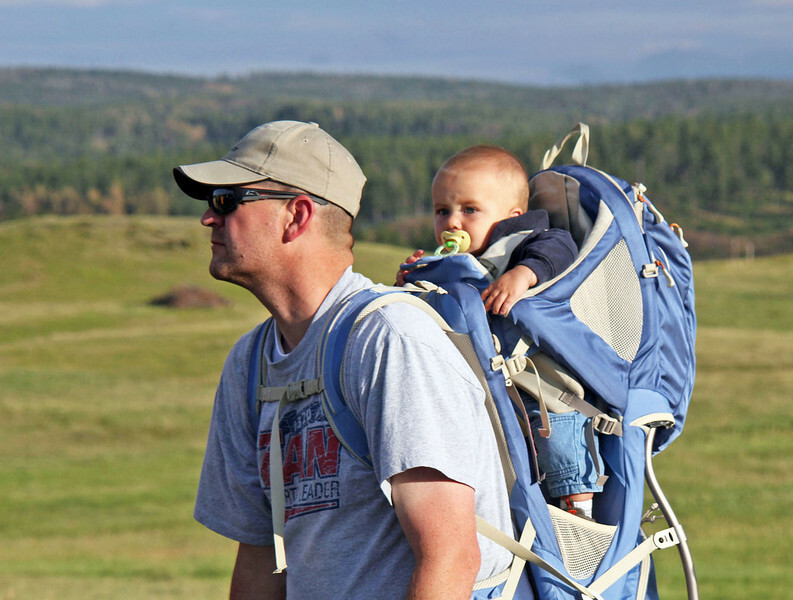 Getting ready for a two-mile hike.....the easy way! It was a good night for photographs! 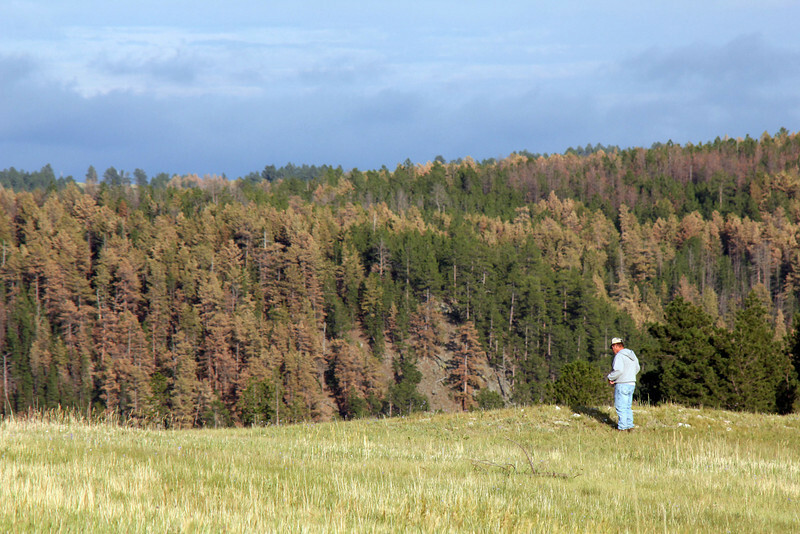 The Rocky Mountain Pine Beetle has left a wretched mark on much of the Black Hills. 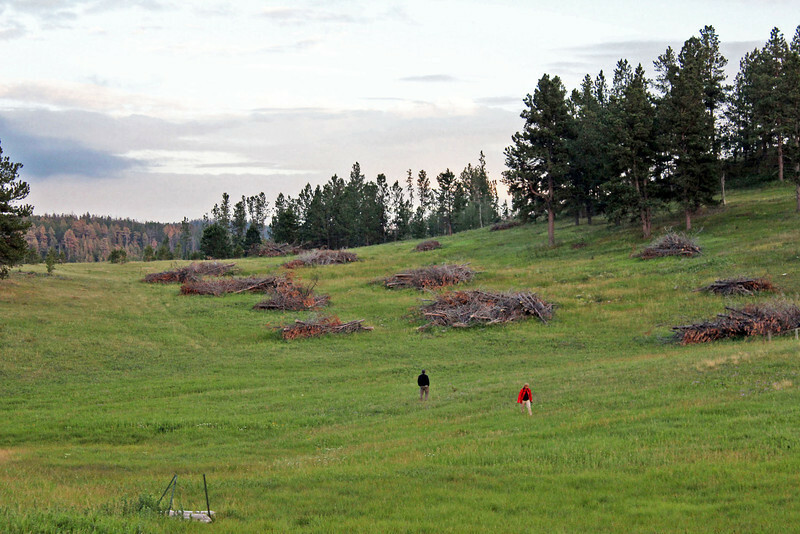 This region west of Custer and Hill City has been hit much harder that in the far northern Hills, although we're seeing increased evidence of the critters. 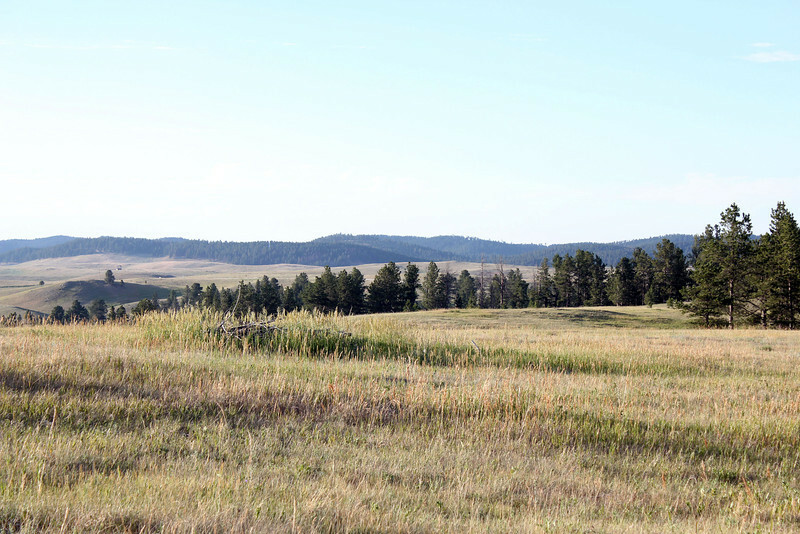 The clump of grass near the center of this picture marks the site where native Americans have conducted Sun Dances in years gone by. 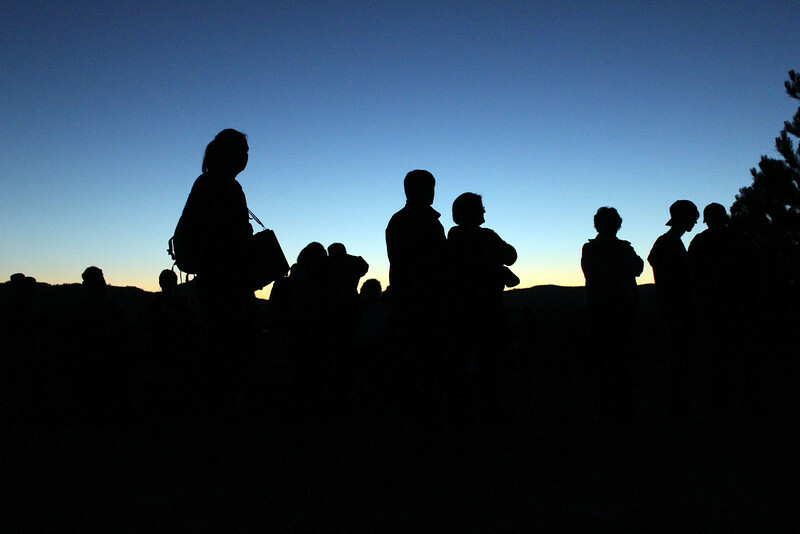 Did we mention that this was a perfect night for a Moon Walk? 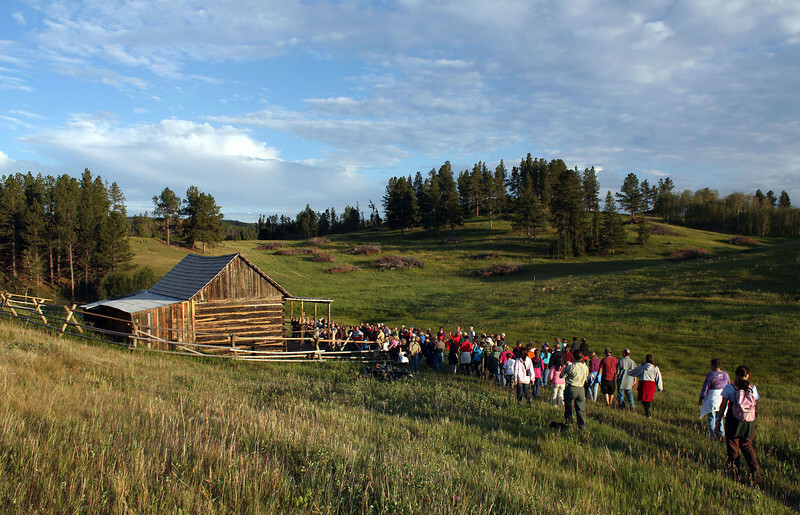 By about 7:30 p.m., our group of about 150 persons arrived at the old Miller Cabin. Salisbury banters with part of the group as others are arriving. 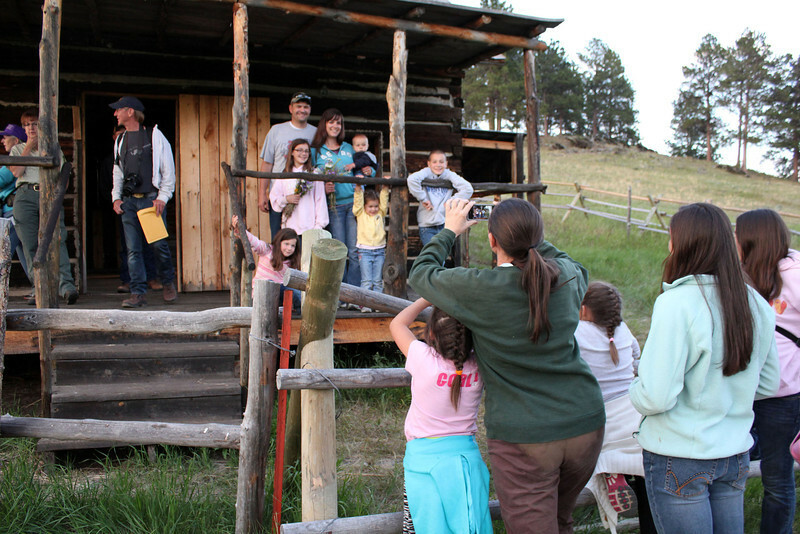 Forest Service personnel and volunteers restored much of the cabin in 2008. 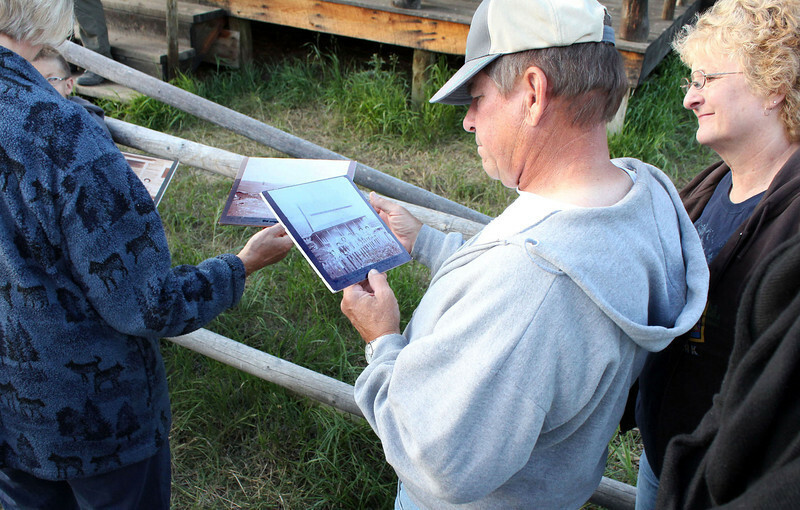 Part of the 2008 restoration project included this interpretive sign that spurs more conversation among Moon Walkers. A group photo. The gent just coming out of the cabin is Ken Anderson of Hill City. Ken was married in this cabin in 1976. His Anderson ancestors bought the cabin from the Miller family in the 1930's. 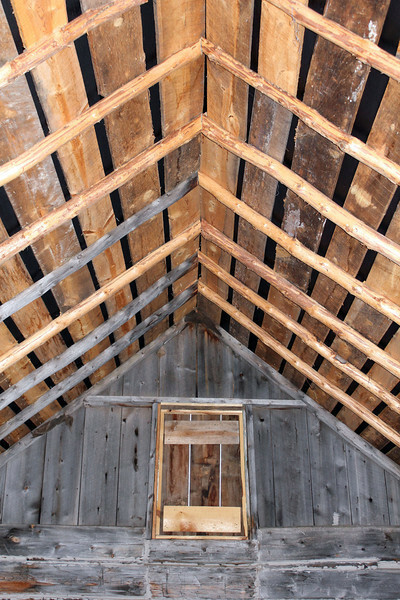 The newly-restored roof on the cabin provides a bit of blessed reassurance that it won't come tumbling down! 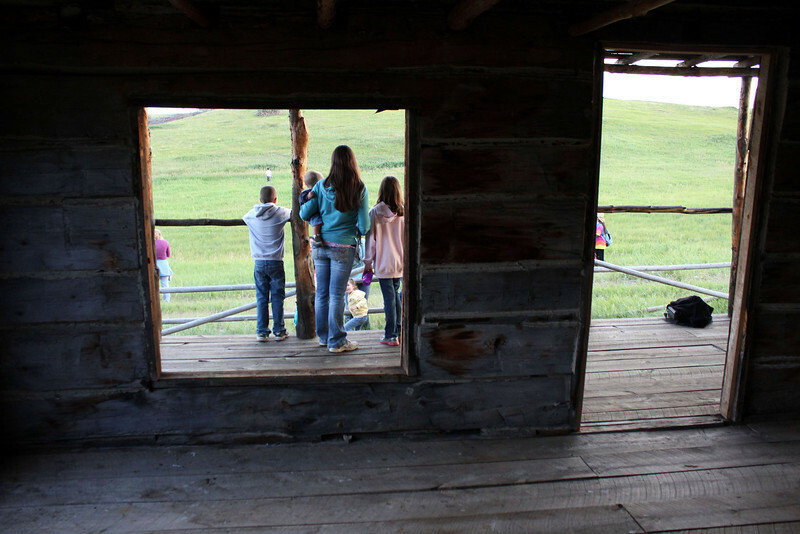 Family stands on the front door looking south toward Deerfield Reservoir, which is over the next hill. Amy Ballard talks with Ken Anderson. 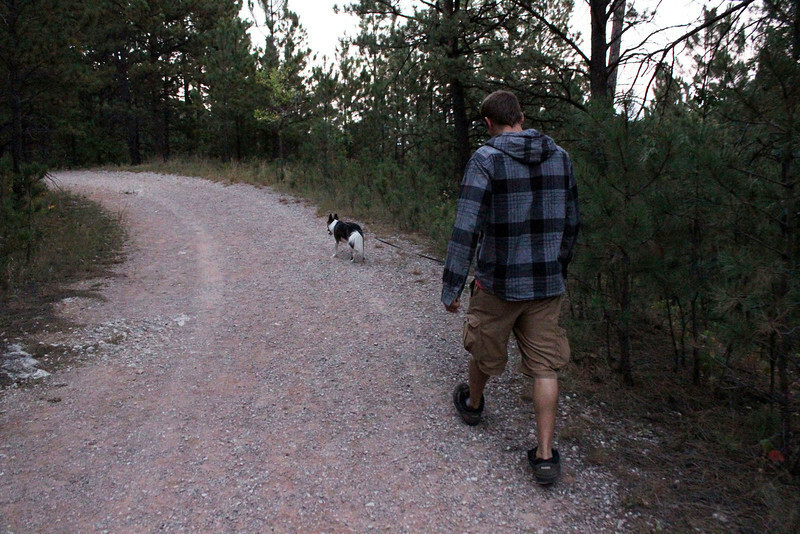 A few stray Moon Walkers exploring the area around the Miller Cabin. Notice the slag piles on the hillside. Ken Anderson had some old photos of the Cabin and the Miller family, which he graciously circulated amongst our group. 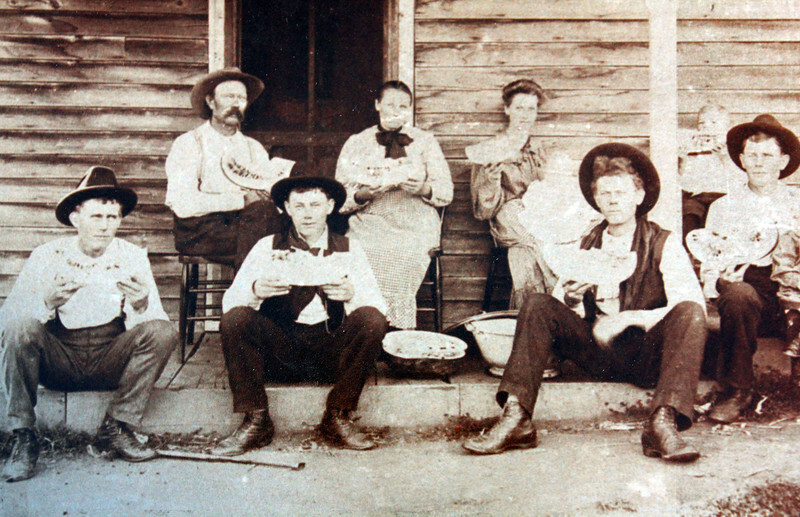 We can't name them, but these folks are all believed to be members of the Miller family that built the cabin. 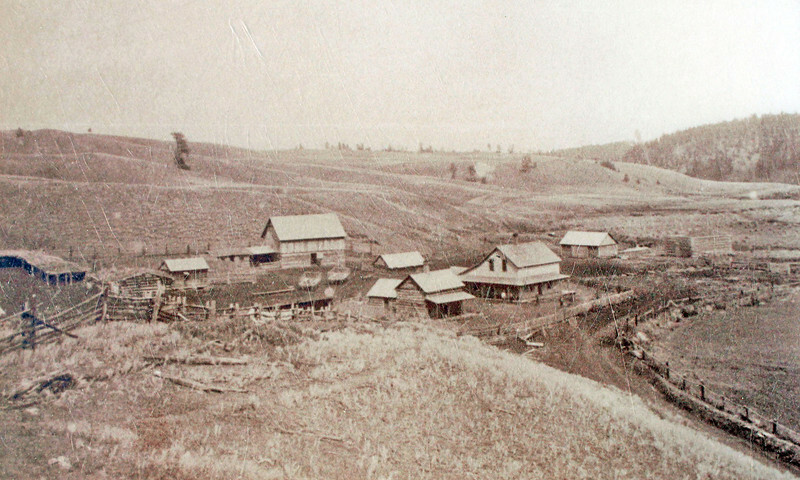 An undated photograph of the cabin (left-center) situated among several other more formidable buildings that would eventually have to be removed from the area to make way for Deerfield Reservoir. 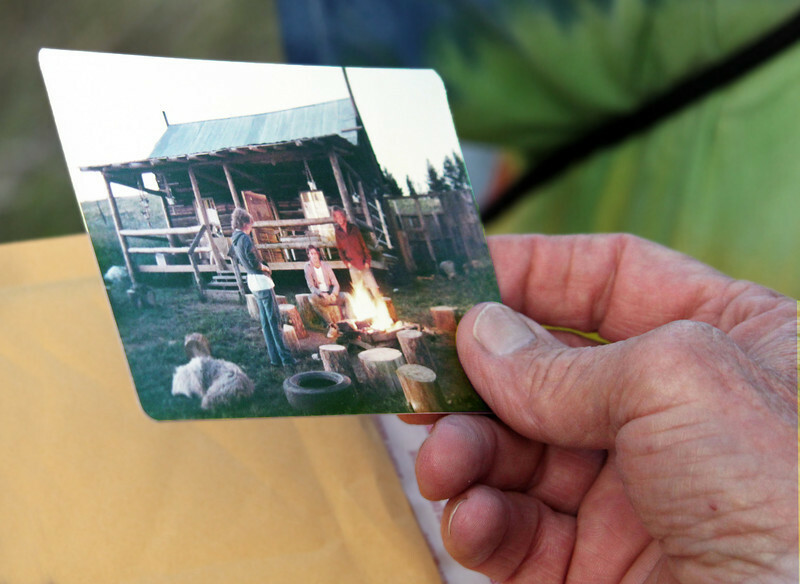 Ken Anderson shared photos that were taken at the cabin in the 1970's, when his family still occupied the structure. 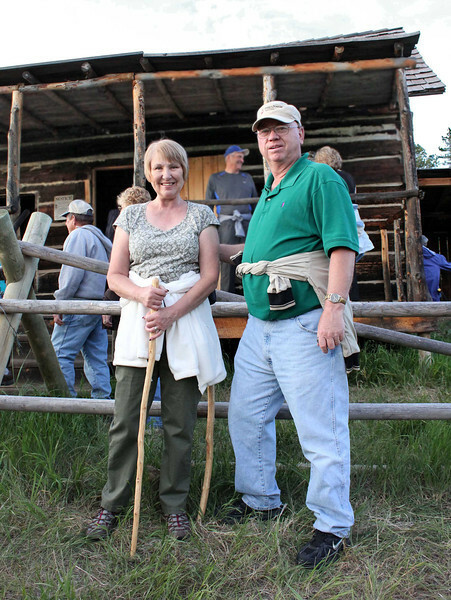 Nancy and Bob Tipton of Belle Fourche are among regulars on these Black Hills National Forest Moon Walks.